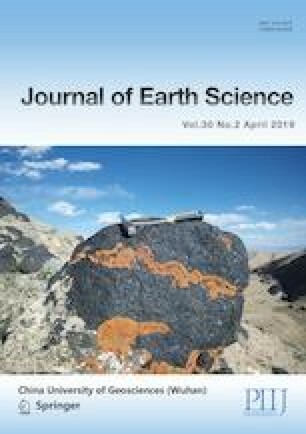 To reveal the petrological characteristics, metamorphic evolution history and tectonic setting of the pelitic granulites from Ailaoshan Orogen, West Yunnan, China, a comprehensive study in mineral chemistry, petrogeochemistry and geochronology studies is presented in this paper. Two metamorphic stages of the granulites can be established: (1) the peak metamorphism recorded by the mineral assemblage of garnet, kyanite, K-feldspar and rutile, and the initial retrograde metamorphism shown by the mineral assemblage of garnet, sillimanite, sapphirine, spinel, K-feldspar, plagioclase and biotite; (2) the superimposed metamorphism recorded by the mineral assemblage of biotite, muscovite, plagioclase, quartz and ilmenite. Zircon LA-ICP-MS U-Pb dating indicates that the protolith of the granulite was deposited after 337 Ma. The initial retrograde metamorphism occurred at P-T conditions of 8.6–12 kbar at 850–920 °C estimated by mineral assemblages, the low pressure limit of kyanite stability and GBPQ geothermobarometer in Indosinian (about 235 Ma), and the late superimposed metamorphism occurred at the P-T condition of 3.5–3.9 kbar at 572–576 °C estimated by GBPQ geothermobarometer since 33 Ma. The first stage was related to the amalgamation of the South China and Indochina blocks during the Triassic, and the second stage was possibly related with the large scale sinistral slip-shearing since the Oligocene. It is inferred that the upper continental crust was subducted/underthrusted to the lower continental crust (deeper than 30 km) and underwent granulite-facies metamorphism and then quickly exhumed to the middle-upper crust (10–12 km) and initial retrograde metamorphism occurred due to the collision of the Indochina and South China blocks during Indosinian, which was followed by superimposition of the second stage of metamorphism since the Oligocene. We thank two anonymous reviewers for their critical and constructive comments. Heartfelt thanks also go to Profs. Zeming Zhang, Jianxin Zhang, and Xiwen Zhou for their discussion and help. Dr. Hua Xiang provided valuable suggestions for the original manuscript. This study was supported by the National Natural Science Foundation of China (Nos. 91755101, 41272219), the Chinese Ministry of Science and Technology (No. Sinoprobe-05-03), and the China Geological Survey (No. DD20160022-07). The final publication is available at Springer via https://doi.org/10.1007/s12583-019-0893-x.